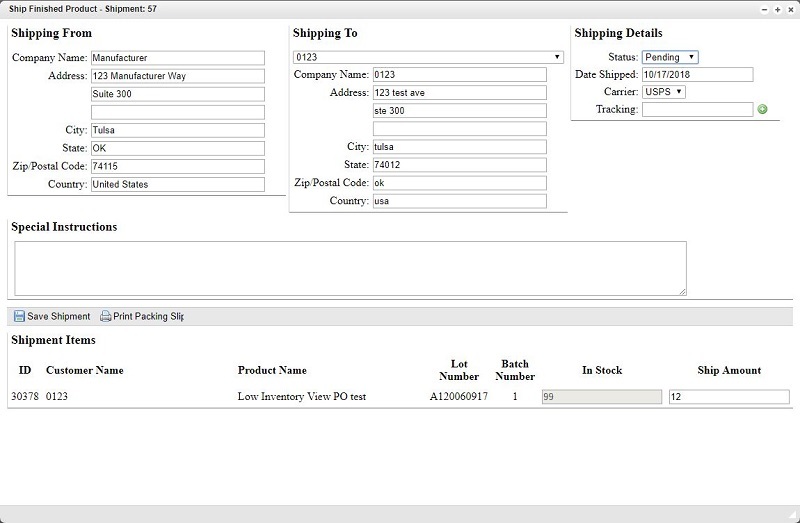 The Ship Finished Product window allows you to generate a packing slip and ship any finished products you may have available in your inventory. This window will display any selected lots under the shipment items section as well as the total amount that is currently in stock. Before adding shipping details and completing the order, you will need to print a packing slip. If an order needs to be modified, you can make changes as needed after the initial shipment has been saved. Before a packing slip can be generated and printed, you will need to complete all required forms. If the shipping from information was not automatically generated or is incorrect, complete this section with your company information. Once this is done, you can complete the shipping to information by looking up a customer from the drop-down menu or manually entering the information. With the shipping information completed, you can then verify the items that are included in the shipment. You will need to add the desired amount of finished product that will be included in the shipment; however, it cannot exceed the In Stock amount. Once completed, click the Save Shipment button and a Print Packing Slip button will appear next to it. Clicking this Print Packing Slip button will save the generated packing slip to your browser-defined downloads location as a PDF file that can be opened and printed. While your finished products will likely remain under a pending status until the packages have been dispatched, it is important to update the shipping details information whenever they become available. Under the shipping details section, you can use the drop-down to change the shipping status from Pending to Shipped or Canceled. This information can be updated as needed to reflect the current order status. Other information includes the date the order was shipped, which carrier was used and the tracking number associated with that order. If the order contains multiple tracking numbers, additional items can be added by clicking the green + button. After the shipping details have been entered, save the shipment again to finish.